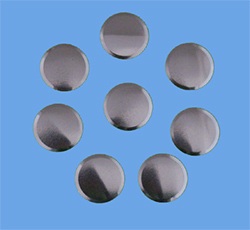 Circle metal dome (round metal domes, circle tactile dome) is circle (round) shaped metal domets which can only used in two or more layers circuit board, or in a precision switch. The C-Series domes will not invert when pushed past the flat plane, and can be used for a over-travel application. Applications requiring a low profile switch under a membrane overlay, keypad, are a perfect fit with our C-Series metal domes. It can be used in smaller space than Four-leg dome, with longer life cycles than triangle dome but price level is similar with it. The size of C Series metal dome is from 3mm to 20mm in a range of (trip) force, typical 100- 600 gf, dome used in most cell phone is 4mm or 4mm @ 130gf, 160gf or 180gf. The trip force, ebound/return force, click ratio, travel, and height, is adjustable according to clients' request. It can be packed in bulk in PE bag, in a pick & place dome array, and in making dome array, it will be packed in steel tube when auto or half-auto machine can pick and put it on glued PET. No matter what size or force you require, we'll do our best to produce it. Contact us now for more about circle metal dome.